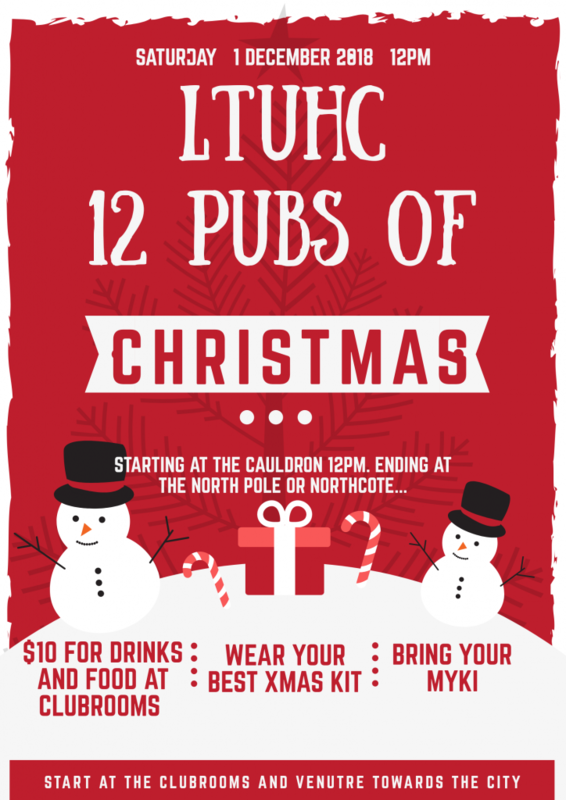 LTUHC’s last social event for the year… The 12 Pubs of Christmas. Starting at the Cauldron, we are having some food on and some drinks, for $10. From there, we will venture down the hipster inner north on Santas Slay (Tram 86) whilst stopping into a few pubs and bars to see who’s been naughty and nice. Dress up in your best Christmas kit and the winner will win a prize. There will be some carols and games along the way. All are welcomed, friends, family, neighbours, grinches; naughty or nice. Should be a great day/night and hope to see everyone there, either for the entire trip or at one of the venues. Any questions, issues or general banter, email Pete or Hannah at social@latrobeunihockey.com or get around Vice Prez Emily who’s running the show.